See for yourself if Silence is golden after all. 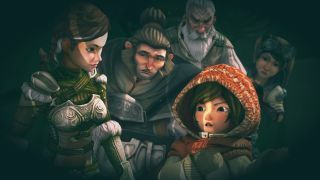 Silence, Daedalic's post-apocalyptic fantasy adventure game and quiet follow-up To Whispered World, is out on November 15. To save you the trouble of checking your calendar, that's Tuesday next week, so not too long to go until we can check out this handsome point-and-click, which mixes 2D, illustrated art with 3D models in a fascinating way. "War rages on. During an air raid, 16 year old Noah and his little sister Renie seek shelter in a bunker. There, not only are they protected from the deadly bombardment, but are also at the crossroads of a world between life and death: Silence. When Noah’s sister gets lost in Silence, he is forced to venture into this idyllic yet threatening world to find her. "Silence, however, bears its own scars of war and suffering. Dark creatures haunt towns and cities and ravage this once serene place between worlds. Only a small band of rebels stands against the looming menace. Now it is up to the siblings to save Silence and its fantastic inhabitants from impending doom and thus also save their own lives."